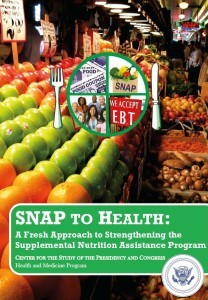 The USDA recently published the Healthy Corner Stores Guide to improve access to healthy foods for residents of low-income neighborhoods, including SNAP recipients. Corner stores, also known as convenience stores or bodegas, often serve as the main source of food for families that cannot purchase fresh produce and other healthy items nearby. The guide provides information, strategies, and resources for organizations that seek to increase the availability of healthy options at corner stores. Philadelphia, PA: The Food Trust’s Healthy Corner Store Initiative aims to encourage youth and adults to purchase healthier foods through education and marketing initiatives. Oakland, CA: ChangeLab Solutions Healthy Small Food Retailer Certification Program works with communities to prepare and participate in policy change, specifically for obesity and healthy eating. New York, NY: ShopHealthy, an initiative of the New York City Health Department, aims to increase access to healthy food as well as build long-term support by the community for improvements in food retail environments. Baltimore, MD: Baltimore Healthy Stores, part of the Healthy Stores Project, focuses on preventing obesity and chronic disease in low-income communities with corner store-based interventions.